One of New Zealand’s most diverse regions by land use, Tasman has virtually every type of rural property, from hill country manuka blocks to dairy farms, and from vineyards to hops to pipfruit to aquaculture to forestry, not to mention some of the country’s top-performing traditional sheep and beef breeding and finishing units. Bringing together buyers and sellers across such a broad range of farms, vineyards and orchards is PGG Wrightson Real Estate’s Tasman rural property team, covering Golden Bay to Kaikoura. Recent changes see all members of the Tasman sales team now able to list and sell property in the top of the south under the banner Tasman Rural Real Estate, which fairly reflects the desire to provide an expanded and comprehensive real estate service to all clients, especially those in the Nelson Tasman region. Joe Blakiston is the Tasman regional sales manager and rural salesperson based in Blenheim. His initial career as a rural professional included roles with Pyne Gould Guinness in livestock, finance and management, before a move to real estate in 1997. 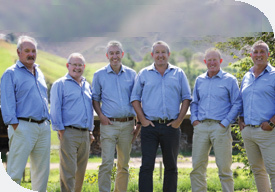 Involved in numerous major sales of viticultural land, dairy farms and forestry blocks, among others, Joe has featured as PGG Wrightson Real Estate’s champion auctioneer in the past. Having refereed rugby to provincial level, he can still be seen out in the paddock on weekends over winter. Joe has also been heavily involved in powerboating with the Rotoiti Power Boat Club, as well as following the sporting and school activities of his children. Also based in Blenheim, Ken McLeod has been a consistent top rural propertyperformer since 1992, and is currently in the company’s top 10 rural salespeople nationwide. Prior to real estate, Ken’s solid rural background included both farm management and ownership throughout the South Island. Greg Lyons was the Marlborough face of tractor brand John Deere for 12 years before transferring his skills to real estate in early 2016. His performance since has seen him recognised as the company’s nationwide ‘Rookie of the Year’ in PGG Wrightson Real Estate’s 2016/17 awards. Before he began selling property in 2016, Mark Terry’s career included shepherding, farm management, contracting and drafting. Ranked number one for PGG Wrightson Real Estate for the region in residential and lifestyle sales for 2017, Mark is currently the company’s number six salesperson overall. When he joined the company in 2005, Richmond-based Peter Evans brought with him many years’ involvement in the rural and forestry sectors operating throughout Tasman. He has regularly been the area’s top rural property performer and maintains his personal connection to farming and forestry. Working alongside Peter to grow the company in Nelson and Golden Bay since 2015, Doug Smith’s background in agriculture includes involvement in the dairy industry’s cadet scheme, work as a fencing contractor and serving as an assistant farm manager on a dairy support unit. Based in Kaikoura, where she was born and bred, Geraldine Straker has sold real estate since 1994, covering Kaikoura’s residential, lifestyle and rural markets. Committed to an area undergoing steady growth, she has consistently been in the top echelon for sales achievement.